1. 4 Auto Insurance ‘Accident’- 4 Auto Insurance Quote thought it was a good idea to use Paul Walker’s death to push their brand…That was a bad idea. 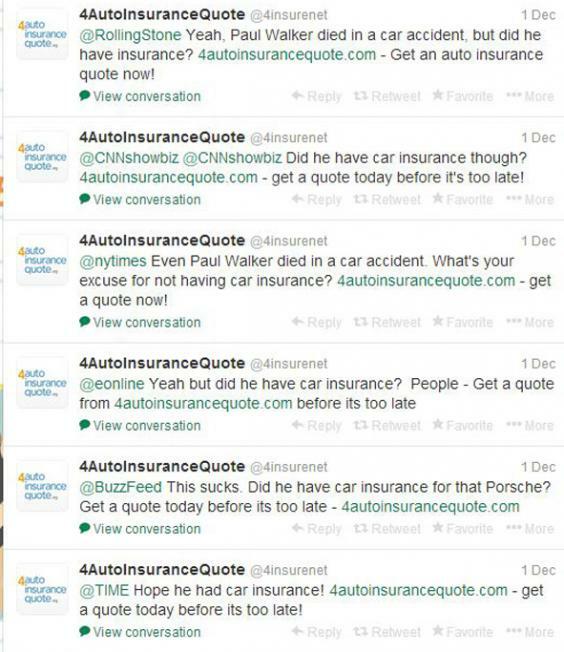 They tweeted several times after he had passed away asking if he had car insurance. Don’t try to capitalize on a tragedy, it can only end badly. 2. 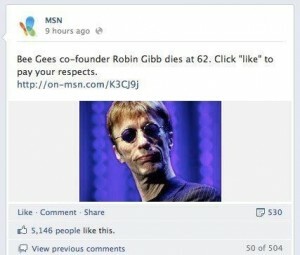 MSN ‘Likes’ Death- After MSN’s co-founder Robin Gibb died, they tweeted out to ‘like’ the post to pay your respects to him. Maybe a nice gesture in thought but it just comes off as taking advantage of someone’s pain. 3. DiGiorno Pizza #WhyIStayed- It is a good idea to piggyback off of hashtags that already have momentum. Just make sure that you check those hashtags before using them. DiGiorno did not check and ended up using a hashtag about women staying in violent relationships which made them seem stupid and insensitive. 4. New York Police #- As we have said before, it helps to have a hashtag to link your customers all together in one place. Be careful though, because it can link very angry people together and put your company in a bad light like this #myNYPD did. People ended up posting negative things that they saw the New York Police doing and the hashtag went viral for the wrong reasons. 5. J.P. Morgan #askJPM Chat- J.P. Morgan decided that they would allow twitter users to ask executives questions about anything to make them seem more transparent. One tweet read, “Did you always want to be part of a vast, corrupt criminal enterprise?” After hundreds of questions like that were asked J.P. Morgan just decided to cancel the whole Q&A. Be careful what you ask for. 6. Epicurious Catastrophe- Again, it’s probably not the best idea to use a terrorist attack as a platform to push your product. 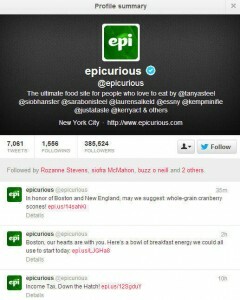 Epicurious learned this the hard way when they tweeted out ways to feel better after the attack at the Boston Marathon. Seems like a good idea but it definitely is not. You think that people would learn not to use tragedies to sell things but I guess they don’t. 7. 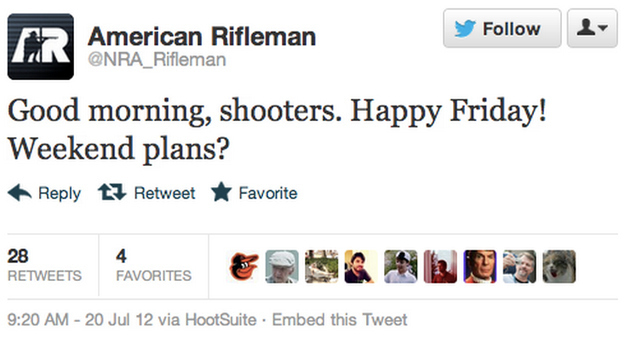 NRA Terrible Timing- A lot of companies have tweets planned out hours, days or weeks in advance. 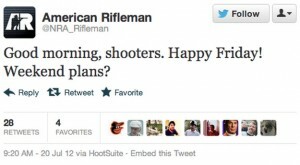 NRA just happened to send out this tweet that was planned a couple days before on the morning of the Aurora shooting. If you are in charge of social media, look at the news and pay attention to what is happening in the community and world before tweeting. If will save you lots of problems in the long run. 8. U.S. Airways’ Pornographic Tweet- One of the worst social media mistakes has been from U.S. Airways’ when they accidentally shared a link of a pornographic image. 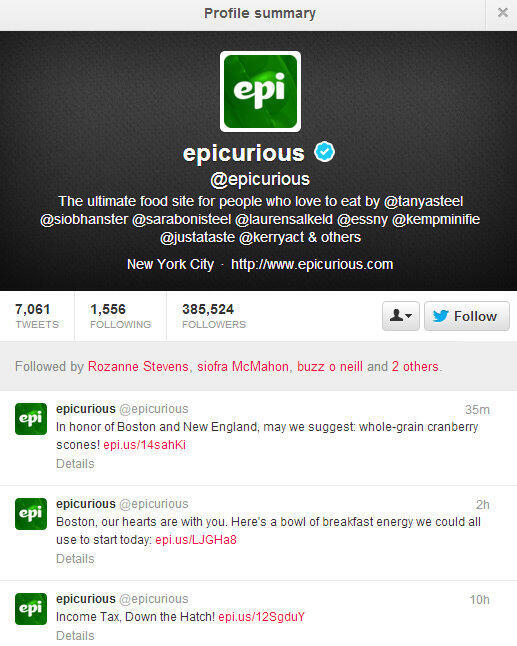 It was on their twitter feed for over an hour when they inadvertently used the image in a response to a customer. You need to be very, very careful when using social media. Once it is out of the box, it is almost impossible to get it back in. 9. 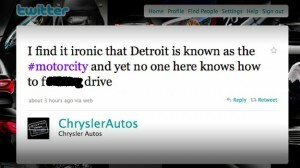 Chrysler’s F-bomb- Another no no? Swearing on social media. This is an unfortunate example of someone tweeting from the wrong account. The social media administer wanted to send this tweet with the f-bomb on his personal account but was still logged into the Chrysler twitter. Double and triple check every time you post something! 10. 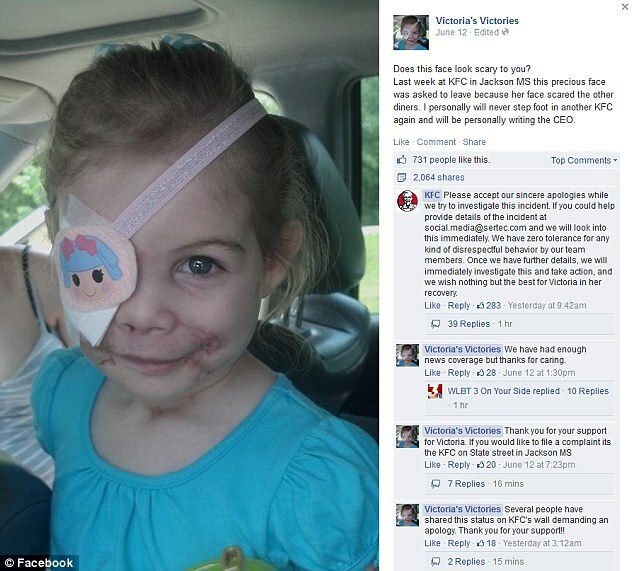 KFC’s Facebook Disaster- Last but not least this cutie, who was attacked by a pitbull, was in a KFC when she was asked to leave the store because her face was scaring customers. Talk about terrible publicity. When the family went onto KFC’s Facebook to complain, KFC took a terrible situation and made it a great one. They ended up donating $30,000 for her medical bills and became the hero instead of the villains of the story. When using social media for marketing, learn from these bad mistakes and KFC’s great one to make sure that you create the right type of publicity. Be careful out there in the social media world!